Plasmon-mediated growth of noble metal nanostructures analyzed with CAMECA NanoSIMS secondary ion mass spectrometer. With its unique simultaneous high lateral resolution (down to 50nm) and excellent sensitivity the NanoSIMS permits high sensitivity direct surface mapping of light and heavy elements without sample preparation. This capability is illustrated on nitrogen, iodine and gold in the following nanoscience article from Nature Materials journal. It is still unknown whether the plasmon-mediated growth of SILVER nanostructures can be extended to the synthesis of other noble metals. In this article the authors demonstrate the plasmon-driven synthesis of GOLD nanoprisms and elucidate the details of the photochemical growth mechanism at the single-nanoparticle level. Their investigation reveals that the surfactant polyvinylpyrrolidone preferentially adsorbs along the nanoprism perimeter and serves as a photochemical relay to direct the anisotropic growth of gold nanoprisms. Upper row: Secondary Electron, 197Au-(red) and 12C14N- (green) NanoSIMS 50L images of GOLD nanostructures obtained after two hours of photochemical growth. 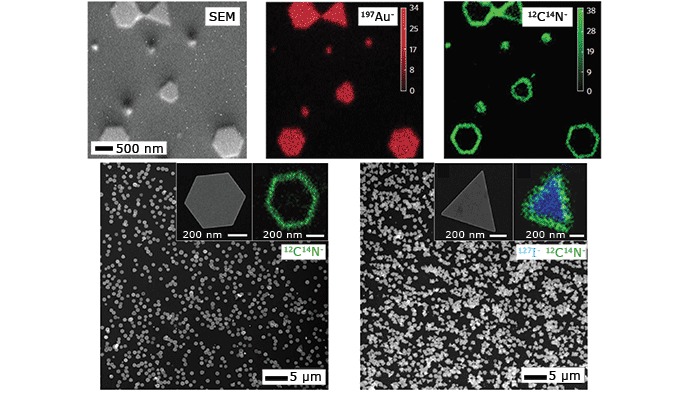 The 12C14N- signals from adsorbed PVP molecules are observed along the perimeter of the planar-twinned nanoprisms and cover the entire surface of the multiply twinned nanoparticles, suggesting that twin-plane defects prompt PVP adsorption onto Au nanocrystals. Lower row: Plasmon-driven synthesis of hexagonal or triangular GOLD nanoprisms adding IODINE. Left, SEM image of Au hexagonal nanoprisms obtained after 2 h of irradiation following the seed separation method. Insets: high-mag. SEM image of a hexagonal nanoprism and NanoSIMS 12C14N- (green) from adsorbed PVP on a hexagonal nanoprism. Right, SEM image of Au triangular nanoprisms obtained after 2 h of irradiation with the addition of iodide (I-) to the growth solution following the seed separation method. Insets: high-mag. SEM image of a triangular nanoprism and showing NanoSIMS images of 12C14N- (green) and 127I- (blue) from a triangular nanoprism. From: Polyvinylpyrrolidone-induced anisotropic growth of gold nanoprisms in plasmon-driven synthesis. Yueming Zhai et al. NATURE MATERIALS, Vol 15, August 2016.